PARASITIC_PROTOTYPE | gURROO - A new generation of innovative minds. Production of plastic has increased from approximately 10,000 tons in 1934, to over 250 million tonnes in 2011 – Surpassing that of metal, concrete and paper in production today. The problem behind the production of plastic is the detrimental effect it is having on the environment, for example; many modern day plastics are made up of mixed polymers, with additives that were added to improve durability and strength – making them harder to break down during bio-degradation. Polymer chemicals such as nonyiphenols, pbde’, bisphenol A are being released into the environment. For example, the burning of PVC or the bleaching of chlorine pulp within paper mills, releases dioxins (C12 H4 CL4 O2) into the air, which then affect the food chain (Vegetation, animals). It is estimated that each person in the western world, throws away approximately 36kgs of plastic a year. But it is not just the amount of plastic that ends up in landfill that is the main issue; Pre manufacturing of plastic also accounts for 11% of all plastic pollution in the environment. This is due to careless transportation of the pre manufactured ‘rice grain’ pellets. Plastics that enter the drainage system, end up accumulating within our oceans. It is here the plastic will break down into smaller pieces, being absorbed into the food chain or becoming part of the ocean’s sediment – eventually affecting what we eat and drink. Like many factors surrounding plastic waste, economics is the influential factor behind the life cycle of plastic and where it ends up. The sorting, control and logistics of plastic recycling is financially intensive and requires investment from operators to kick-start a trend of recycling, reprocessing, and recovery in order to make it financially viable in comparison to producing virgin materials. It goes without saying that in years to come, processing virgin plastic will be less economically viable than reprocessing plastic material waste, taking into consideration that rising costs of raw materials such as oil and gas, will have an influence on the cost of the production of plastic. This may well result in more investment into reprocessing plastic waste. My proposed interpretation of this would consist of a mechanism that has all the resources for reprocessing of plastic waste, self-contained within a vertical scaffold. This allows for a stand-alone structure, with the ability to be deployed in many locations and situations around the world. It will take in mixed plastic waste and export out natural polymers, in the one location; a stand-alone ‘plastic reprocessing machine’. 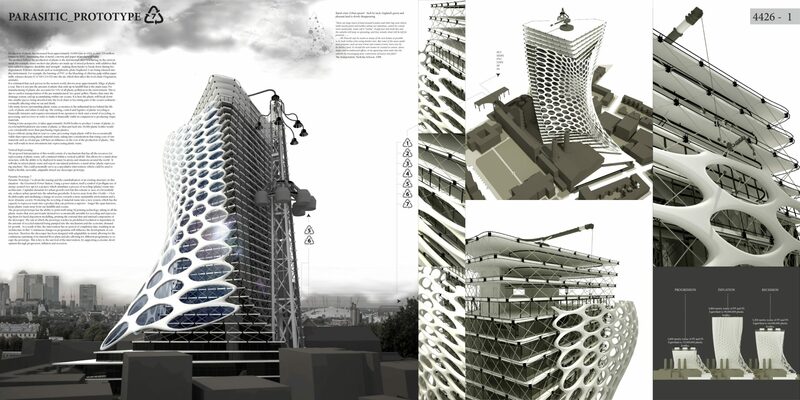 Or for this instance, potentially serving a speculative intervention, which could be used to help build a flexible, moveable, adaptable mixed-use skyscraper prototype. 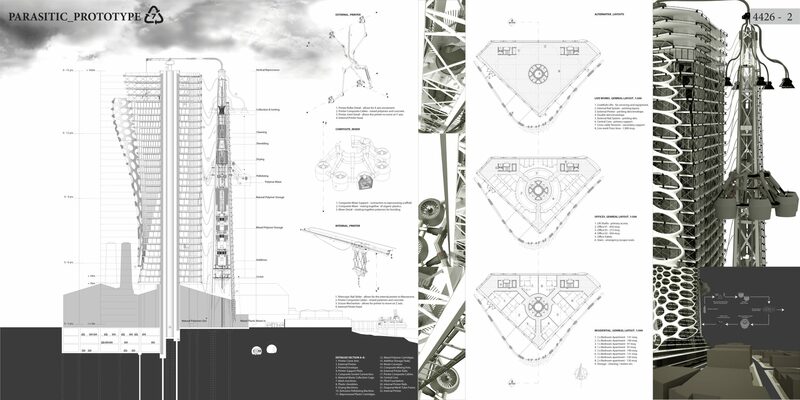 Parasitic Prototype 7 is about the reusing and the cannibalisation of an existing structure, in this situation – the Greenwich Power Station. Using a power station, itself a symbol of profligate use of energy seemed very apt for a project, which stimulates a process of recycling (plastic) waste into architecture. Capitalist demands for urban growth exist but this scheme re-uses of a brownfield site, reduces urban sprawl into the suburban greenbelts. It moves away from this 1 bottle = 1 bottle philosophy and mediating a change in society, towards a more sustainable environment and a more dynamic society. Promoting the recycling of material waste into a new system, which has the capacity to reprocess waste into a product that can perform a superior – longer life-span function, keeps plastic waste away from our landfills and oceans. 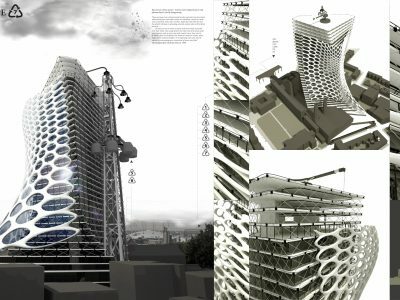 The proposed prototype has the ability to print itself using 3D printing technology, taking in all the plastic wastes that were previously deemed too economically unviable for recycling and reprocessing them for fused deposition modelling, printing the external skin and internal components of the skyscraper. The rate at which the prototype reaches its predefined resolution is dependant on the amount of recycled material being pumped into the mechanism and the economic demand for growth. As a result of this, the intervention has no period of completion date, resulting in an ‘architecture in flux’. Continuous changes in programme will influence the development of construction. 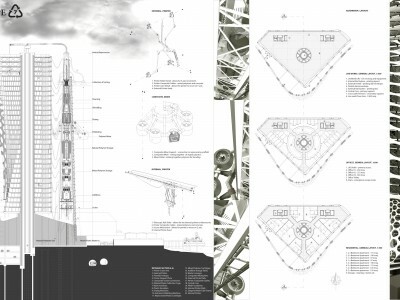 Therefore the skyscraper has been designed with adaptability in mind, allowing for the continuous reprinting of its internal floor plans and also allowing for different programmes to occupy the prototype. This is key to the survival of the intervention, supporting economic development through progression, inflation and recession.